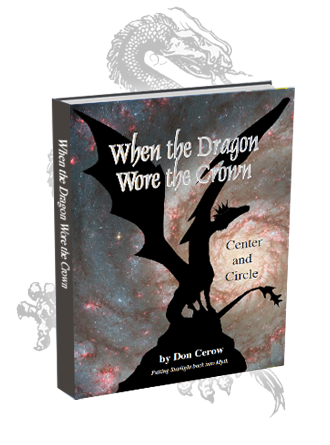 In our book, When the Dragon Wore the Crown, we contend that long ago cultures all over the world shared an ideology of a great flying serpent that wrapped his considerable bulk around the North Celestial Pole and chased his own tail for literally thousands of years. In other words, the source of this myth was astronomical. He goes on to list a number of locations all over England that lay claim to these Dragon paths. Amen. What my own research has revealed is that, as legend records, the Dragon was born of the Egg, and like Pan Ku of China and the Dioscuri (Castor and Polydeuces) of Greece who were also born of the Egg, this simply indicates that they were born during a period of time when the Twins of Gemini were marked by the constellational passage of the Vernal Equinox (Spring) through this sign. These ‘myths’ were told sometime between 6300 and 4800 BC when this was the astronomical ‘picture’. These myths preserve traditions which were in place long before ‘history’ came to be. History is founded on the written word, and this was a period of time long before writing as we know it came to be. Among other things, the observation of the Dragon helped to define the celestial passage of the year through the Seasons and provided a framework against which to observe stellar passage and to provide guidelines for the local farmers and the tending of their crops. To this day the Chinese remember this tradition in their New Year’s association with the Dragon in a celebration of the end and beginning of the year. What we have here is our ancient observatory, where artificial mounds were carefully constructed to give an excellent spot to observe the heavens, marking by the contours of the local terrain, just like the Native American Mississippian cultures build artificial mounds for the same purpose all over the eastern US. Many indigenous traditions still have stories about the great serpent, who once spread his wings over and embraced the entire planet.